If you have been following our recent reviews, you might notice that we have been reviewing several storybook apps, ranging from the ones for younger readers to the one for teenagers and from fairy tales to original stories. This is no coincidence -- I have great admiration towards great authors. I highly appreciate the amount of efforts, creativity and imagination that are poured into creating enjoyable stories. Today, I will highlight one of the works of Miguel de Cervantes, the most famous Spanish writer in history, who lived during the late 16th century through the early 17th century and became the source of inspiration for many other writers. He was so admired that the Euro coins bear his portrait and signature. The Adventures of Don Quixote is an app adaption of the famous Spanish novel by Miguel de Cervantes. 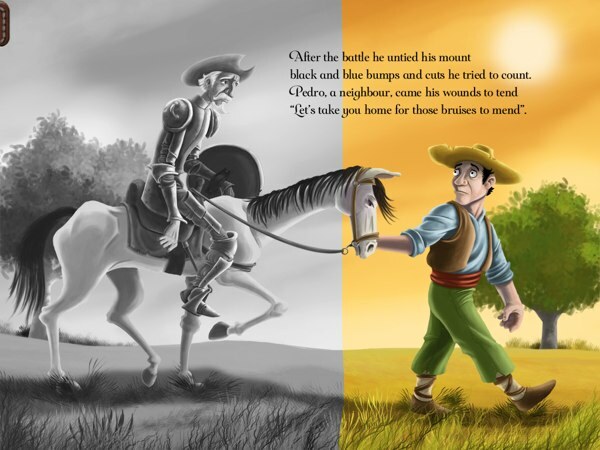 The Adventures of Don Quixote is an interactive storybook app developed as part of a project subsidized by the Spanish Ministry of Education, Culture and Sports. It is an interpretation of the famous novel written by Miguel de Cervantes originally entitled The Ingenious Gentleman Don Quixote of La Mancha and published in 1605 and 1615 as two separate volumes. The novel follows the adventures of Alonso Quijano, a middle-aged hidalgo who, after reading too many chivalric novels, dreams of becoming a bold knight under the name of Don Quixote. Accompanying him on his quest to slay imaginary dragons are his loyal mule and his neighbor-turned-sidekick, Sancho Panza, who dreams of calling an island his own. Don Quixote is a unique character who sees things differently than other people, often mixing dreams into reality. Throughout the book, you will see how Don Quixote imagines the girl next door and a servant girl that takes care of him to be princesses. He also imagines an old inn as a fantasy castle and its keeper as the castle's lord. He even smashes into a brick-and-mortar windmill thinking that it is a giant ogre that he needs to slay. Interactive elements bring Don Quixote's imagination-filled world to life. In order for the readers to understand Don Quixote's imagination, they would have to switch back and forth from the real world to Don Quixote's imaginative one. Fortunately, the iPad is the perfect platform for this transformation -- with a single tap, you can transform the world from one to the other. Helping to make the story come to life are beautiful illustrations by Miguel Calero and an excellent musical score by Michael Kropf. If you want to learn more about the process that went into the making of this iPad app, you can watch this Prezi presentation from the developers. Games, such as jigsaw puzzles, engage juniors as they read. The Adventures of Don Quixote is a well-implemented storybook app that includes many interactive elements essential for young readers. Juniors can play with the jigsaw puzzle and help out Don Quixote wield his armor suit, tap and smear the pages to find 14 hidden shields, drag a match to light a fire, spin the windmill in any direction they wish, paint with magical ink, play a Tower of Hanoi mini game and turn the pieces of a page into a unique puzzle. The book is narrated in two languages, English and Spanish. You can also record up to two different user voices as custom narrations for the book. This is perfect if you want to have different members of your family narrate the story for your juniors. The Adventures of Don Quixote incorporates steampunk elements throughout the app and the settings and recording pages are designed heavily in the theme. The app has a beautiful page navigator, allowing your juniors to slide the film roll through an old TV tube to select the page they want to read. Finally, parents should also take note that the story features several fighting scenes so it might be a wise thing to introduce the book only when your juniors are ready to interpret them appropriately. The Adventures of Don Quixote incorporates many steampunk elements. The Adventures of Don Quixote is an excellent modern implementation of the classic novel by Miguel de Cervantes. The iPad is a perfect platform to illustrate how Don Quixote imagines the world differently than many of us. I would recommend this book if your juniors have started to read classical stories. The story is light, fun and imaginative. I had a lot of fun reading the book.